Synopsis: Chaos consumes a small town when a chemical facility explodes releasing a deadly toxin. Moments after the leak, the town’s residents show signs of mutation, causing the military to quarantine the area leaving any survivors helpless and trapped inside. The story follows Jim, a young man isolated within the red zone, as he eludes flesh eating zombies in an attempt to win back his freedom. 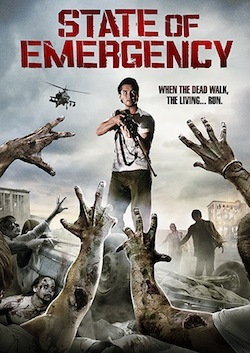 Quick Review: State of Emergency is an interesting low budget indie movie that spends more time focusing on its characters than it does on zombie attacks. And it’s not as bad as it sounds actually. Quite similar to The Battery, strong leads and character development all make up for the lack of action on screen. State of Emergency feels like an episode of The Walking Dead (you know one of this episode where not much happens until the end) with better dialog. Unfortunately, technically it also sounds and looks like a TV movie. The sound mixing is quite awful and the score reminiscent of the numerous horror/fantastic shows on tv right now. The special effects are quite awkward but fortunately the zombies make-up are alright. If you’re a fan of the post-apocalyptic genre and zombies in particular, you will enjoy State of Emergency for what it is, a low-key entry in the genre. Click Here to watch State of Emergency Online Now!